Skoda is one of the long established manufacturers in the world. Currently it offers the Fabia, Rapid, Citigo, Yeti, Superb and the Octavia in the automotive markets all round the world. However, their most successful and flourishing car is the Skoda Octavia. 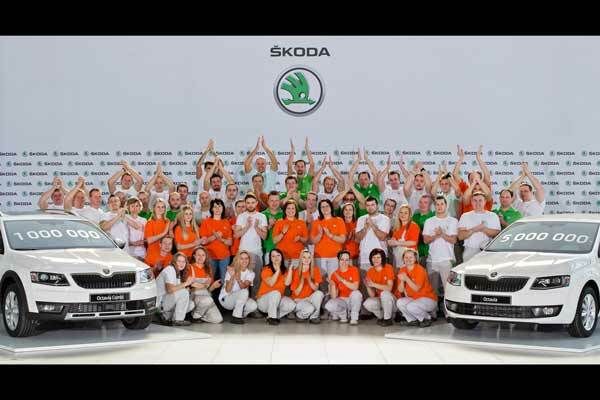 Recently, Skoda Auto achieved a milestone by rolling off the one millionth Skoda Octavia from their production plant in Mlada Bolesav (Czech Republic). The car was the Octavia Scout in moon-white colour. Approximately five million Skoda Octavias have been produced post its launch long back in 1996. The third-generation Skoda Octavia is more diverse than ever. The Octavia hatch and estate are available with front-wheel and all-wheel drive. The Skoda Octavia RS is the fastest series-produced Octavia of all time. The Skoda Octavia G-TEC with natural gas drive and the Octavia Scout, a robust all-rounder with impressive off-road qualities, debuted in 2014. The third generation of the Octavia was launched in the market in 2013. Most Octavia models are produced at the main plant in Mlada Boleslav. In addition to production in the Czech Republic, the vehicle runs off the assembly lines in China, Russia, India and Kazakhstan as well. In 2015 alone, 432,300 vehicles from the Octavia model series were sold around the world, which is around 11% more Octavia models than the previous year.